When I started this column, I wanted to write about putting together a complete medical kit. The more I thought about the idea, the more I realized how complicated the task would be. First, you have to keep the size manageable while making it reasonably complete. This becomes difficult when you consider that everyone boats in different venues, at different times of the year and in different climates with different groups of people, all of whom have individual needs. After much consideration, I broke the topic into two segments: on-board medical kits for groups with an organizer and staff, and kits for those traveling alone. Some commercially available kits have compartmentalized groupings based on medical “chapters,” like trauma, allergies, and cuts and bruises, allowing you to pick the modules you want to carry. I think this is a great way to organize a kit but not to produce it. Most kits need a little of everything. No one medical kit works for every boat and event organizer or every situation. The single most important aspect in determining what to include is the time it takes for a person in trouble to get professional medical help. This is key to deciding what and how many supplies you need on board, how much medical training you may need, and ultimately how secure you will be. If you are never going to be farther than 10 minutes from medical help or transportation to a medical facility, you don’t need suture material and oxygen. However, if you will be days away from medical help and transport, you’d be advised to know a lot about medical care and have a complete medical kit to back it up. Useful medical knowledge when help is days away includes CPR with AED (automated external defibrillator) training, a basic knowledge of wound suturing, handling most medical emergencies, and treating infections and toothaches. You must know how to use all the medical supplies in your kit. Know all crewmembers’ medical history and special medical needs (i.e., diabetes) as well as how to begin treating these conditions if needed. Event organizers should be able to deliver care on the water and on land for land-based events. On land, you only need a simple first aid kit, as professional care is only a phone call away. Many companies offer premade kits, some more complicated than others. You can use some of these kits as starters and build them up to a sufficient level of usefulness. Putting together a medical kit is a learning experience, and if you take the time to put it together, you will know how to use what’s in it. I don’t recommend relying on a purchased kit you’ve never opened to provide help when a true need arises. Some companies will customize and personalize a medical kit for you. They offer a high level of expertise and assistance, and the kits are often linked to direct satellite email and voice support. However, you can expect to pay handsomely for this specialized service. Your doctor can help you tailor a medical kit to you and your family’s needs. You may need to see your physician several times and make specific appointments for this purpose. If you will be traveling hours away from medical attention, consult your doctor for help developing a medical kit, especially if you or your crewmembers have a chronic illness or debilitation requiring medication or medical support, such as diabetes or a heart condition. As a skipper, it’s your responsibility to plan for these needs. Don’t go to your doctor without a game plan. Have questions and a basic idea of what you will need prepared in advance. Discuss elements of the kit needed for general preparedness and your own personal needs. Consider bringing a sample kit with you. This will save time, and you’ll leave feeling you accomplished something concrete and got your money’s worth. Discuss how far you plan to venture, where you will go and whether help will be immediately available. Some areas have infestations that could cause disease, such as Lyme disease and Babesiosis, which may require preventative measures. Preventative measures and medical supplies vary for different cruising grounds. You also need to be able to handle situations like diarrhea and allergies that could ruin your trip but may not be extremely dangerous. You can obtain medical supplies and drugs with a doctor’s prescription. Remember to document all drugs and supplies on board with an inventory list and a copy of prescriptions. Log all medications dispensed and to whom. Not only will this keep your kit up to date and well supplied, it will help you avoid misunderstandings with the authorities. If you have drugs on board with abuse potential, even a friendly Coast Guard inspection could cause problems. 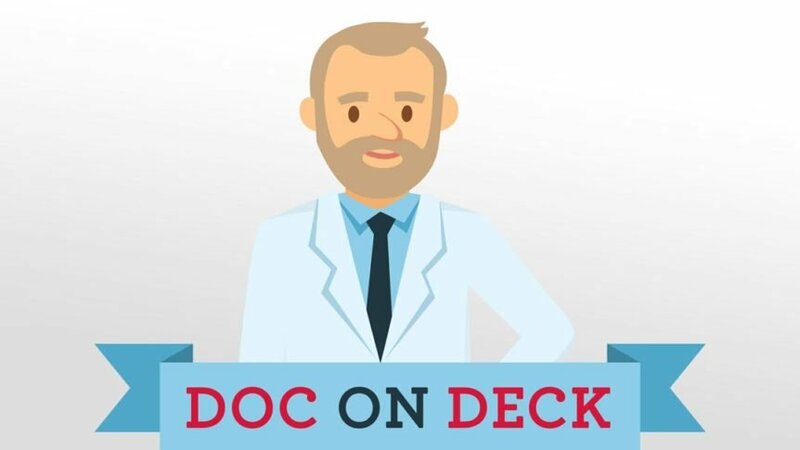 If you are under a doctor’s care for a chronic illness such as asthma, diabetes, and angina, discuss your plans with the physician regarding the physical limitations of a cruising boat, the time needed to get medical help, and your crew’s training and availability to help, which may be vitally important if you are the victim in a medical emergency. Most doctors will be glad to help you equip your kit, especially if you have specialized training, know how to use a medical kit, and can clearly communicate your needs and abilities. Just as you carry appropriate charts and cruising guides, you should also have a ship’s medical library. The farther away from help you are, the more extensive the library you should have. “Advanced First Aid Afloat” by Peter Eastman, M.D. “Your Offshore Doctor” by Michael Beilan, M.D. “Complete Guide to Prescription & Non-Prescription Drugs” by H. Griffith, M.D. I highly recommend that you and at least one other crewmember take the basic first aid course and the CPR course offered by the American Red Cross. You can also take more advanced training, including suturing, administering advanced first aid and even advanced CPR. If you feel you need this training, your doctor can arrange for training sessions or let you know where to find advanced courses in your area. In the next issue, we’ll break down the components of simple medical kits. See you on the water!